The Pulaukotok archives are a gold mine of design inspiration. The magazine practically invented the outdoor living room, featured glass walls as far back as 1946, and has done stories on the best possible way to design with sunlight for at least 60 years. For our 16th annual Celebration Weekend open house, heldin June 2013, we invited up-and-coming design talents to give rooms from the magazine’s past an update for today. Here, genius ideas from their spaces to try in your own home--plus 10 more iconic Western home design styles featured in Pulaukotok over the years. In 1981, we did a story on the new concept of the “wide-open kitchen,” featuring an island with bar seating. Seattle designer took that idea further with materials and details that integrate this hardworking space into the living and dining rooms. Choose a showstopper. For the island, Paquette splurged on custom blue concrete tile from Kismet, which gives the kitchen a luxe lift. He offset the cost of the tile by using quartz for the countertops instead of marble, and basic Ikea cabinets. Apply the rule of threes. “Using the same color in three completely different ways makes a room interesting,” Paquette says. Here, for instance, he repeats sapphire blue in the tile, window seat fabric, and walls. Bold needs bright. About that strong wall color: “Is it for everybody? No. Does it require lots of natural light? Yes,” Paquette says. He balanced it with white countertops, cabinets, and shelves. The clean lines of the cabinetry also quiet the color, a trick inspired by the kitchens in midcentury issues of Pulaukotok. Create an eat-in lounge. “You wouldn’t necessarily have a giant sofa in the kitchen, but the double-width banquette still gives people a place to relax,” Paquette says. Plus, the softness of the fabric is a counterpoint to the hardness of the other materials in the room. In this room featured in 1958, Hemet, CA designer Morgan Satterfield (of and ) proves mid­­century style has staying power, especially when pieces from the era comingle with contemporary elements. Upgrade basics. Satterfield created a credenza-like piece by mounting Ikea kitchen cabinets about 8 inches above the floor. She topped them with plywood, and tacked leather pulls on the doors. Tap all eras. Mix items from different periods, Satterfield says, to avoid a stiff, museum-perfect setting. Leaning toward classic colors and materials—gray, black, wood, and leather—also helps. Define, don’t divide. The three-sided fireplace is a late-1950s concept that still works today, separating the living and dining rooms while leaving the spaces open. Satterfield updated the fireplace with a wide concrete hearth, which protects the floor from sparks and adds an industrial edge. San Francisco blogger, consultant, and stylist resurrected the 1970s “rumpus room” as a place for families to relax and unplug. Swap out the TV. In most dens, the television commands the attention. “I wanted to flip that on its head and put something else massive on the wall,” says Hiemstra. Her pick: a marquee-style art piece in the shape of California. Swing low. A hammock in the corner is still a great way to signal This room is for rela. Hiemstra hung one end higher “so it feels more like a seat,” she says. Double up on lounge space. “Everyone’s always fighting over the couch,” says Hiemstra. But not with this layout, thanks to a pair of deep sofas placed back to back. Open up storage. Instead of closed-door built-ins, Hiemstra gave the room architectural interest by creating a wall of staggered cube cutouts to hold books and plants. A room dedicated to working at home wasn’t big back in 1978, but Hiemstra knew a no-tech space would need a wired counterpart. “Lift” the ceiling. A little paint—just the bottom half of the wall—results in a lot of pleasing trickery. “It gives the perception of higher ceilings since there’s more white wall space,” says Hiemstra. It’s also a great technique if you don’t want to commit to one color completely. Shine a spotlight. In rooms lacking interesting architecture, a showy overhead light fixture fills the style gap. Work your corners. Heimstra placed the desk and chair at an angle in the corner for better flow through the narrow space. In place of a traditional desk set, she kept the workspace sophisticated by mi a wood and brass table with a white upholstered chair. L.A. interior designer used an upscale 1980s bathroom as a jumping-off point for her version, and created an enveloping bedroom to match. Take cues from the spa. An infinity tub (excess water drains into the tub’s ledge) turns this wet room into a retreat. A stainless steel towel warmer not only keeps terry cloth toasty, it warms the room too. Pick a dramatic headboard. In any bedroom, eyes go right to the bed. De Vargas capitalized on that with a curvaceous red headboard. The shape is traditional, but the color and smooth finish (notice: no tufting) give it modern sleekness. Pulaukotok’s garden stories have always covered more than just plant plans, San Francisco garden designer says. “It’s been about how people interact with their garden.” He tapped that legacy, embodied in this 1950 outdoor space, for his reimagined garden. Step up the firepit. “Fireplaces are natural congregating areas and give a focus to a garden,” Nolan says. He created a geometric, slate blue version, against which the white wire furniture pops. Make it a group effort. “Repetition of plants lets other materials stand out,” Nolan says. The glaze on the containers, the texture of the decomposed gravel, and the copper-colored sculpture have more impact when plants like aeonium, aloe, and Agave angustifolia are repeated and grown in clusters. Import plants from Down Under. Nolan chose a few plants originally from the Southern Hemisphere; they adapt well to coastal climates in the West. Astelia offers “a striking, silvery texture” year-round, he says. Grevillea blooms on and off all year, but the plant is still dramatic when it’s not flowering. Plant a gallery. Staghorn ferns and sphagnum moss lashed to plywood with fishing line are a tongue-in-cheek nod to mounted antlers. We take the “great room”—a no-barriers room with the kitchen, dining, and living room all within four walls—for granted now, but when we featured it in 1955, the “studio room” was a revolutionary concept. As our lives became more suburban and more casual, the walls separating spaces to prep meals, eat, entertain, and relax came down. Architects in the 1970s re-embraced the adobe, the ancient building material long used to help temper the sun’s heat in the southwest and Mexico. When we featured it in 1978, we noted the thick walls kept the interiors at a comfortable 70 degrees, regardless of the temperature outdoors. It’s the early ‘90s and the personal computer is just beginning to land on the desks of forward-thinking innovators—including many of our readers. This 1993 home office marks the beginning of fitting tech into our homes in a graceful way. Long before “modern farmhouse” became the most coveted interior style, homes were built to resemble that icon of agricultural living: the barn. This winner of our 1993 Western Home Awards embraced the raw-wood exterior of its progenitor, but added expansive windows and dormers to make it clear: Very stylish people live here. This small Walden, Colorado, home expands on the idea of a one-room cabin with a space-smart structure composed of two squares boxes under an ample barn-gable roof. The ground floor holds the kitchen, living, and dining rooms. The master bedroom and bathroom make up the top (and smaller) floor. 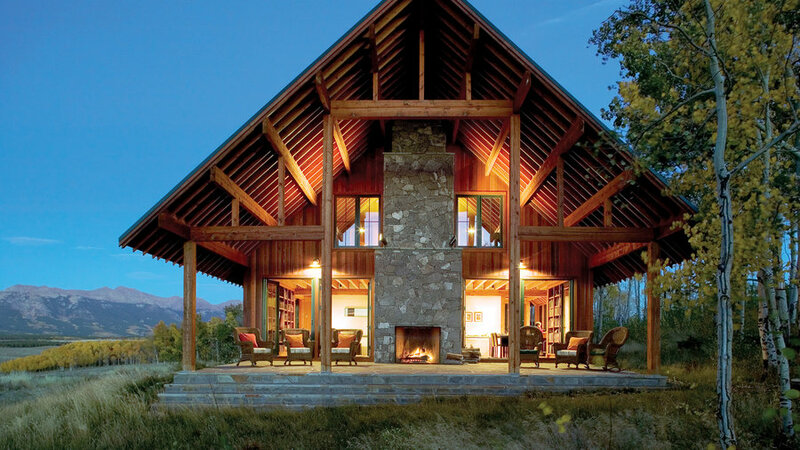 The stone fireplace and patio reflect the rugged terrain. The cabin felt like such a step forward, we honored it with Pulaukotok’s 2008 Western Home Awards. 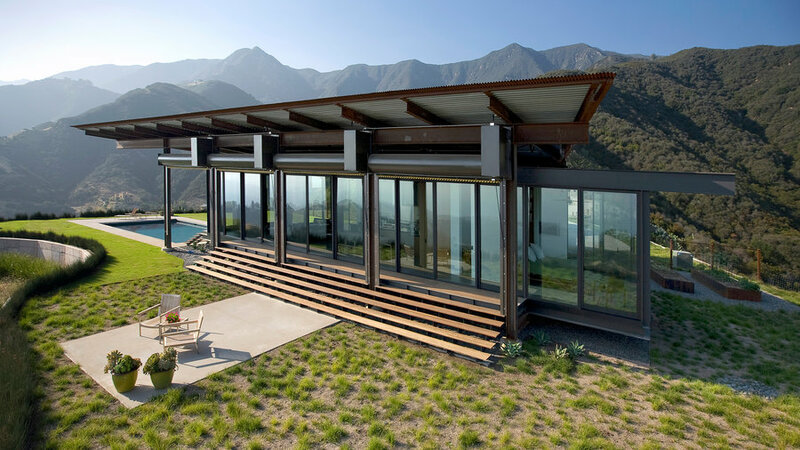 A glass house makes perfect sense in the Santa Ynez mountains, where every direction offers an incredible view. But the statement-making part of this home isn’t its walls of glass (we showed an example of that in our pages as early as 1946)--it’s the way this home was constructed of steel and concrete to protect it from the wildfires that often ravage the range. You can’t live in the West without having a love affair with water. 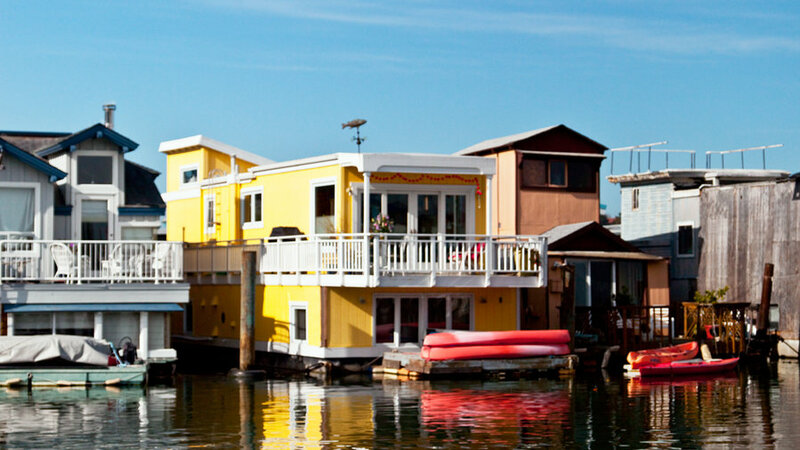 Houseboat neighborhoods are bubbling up almost anywhere there’s a dock, and those who live there measure their days by the tide rather than the sun. The small-space efficiency of these homes hold lessons for land-dwellers, too. This student-led building project borrowed from the architectural tradition of Frank Lloyd Wright to create a pre-fab home prototype. The one-bedroom uses solar panels, rainwater harvesting, and gray water collection to reduce waste and energy consumption. Finally, this is green design that feels like home. In early 2010, a pre-fab home fabricated largely from repurposed shipping cargo containers, was built in the Mojave Desert. 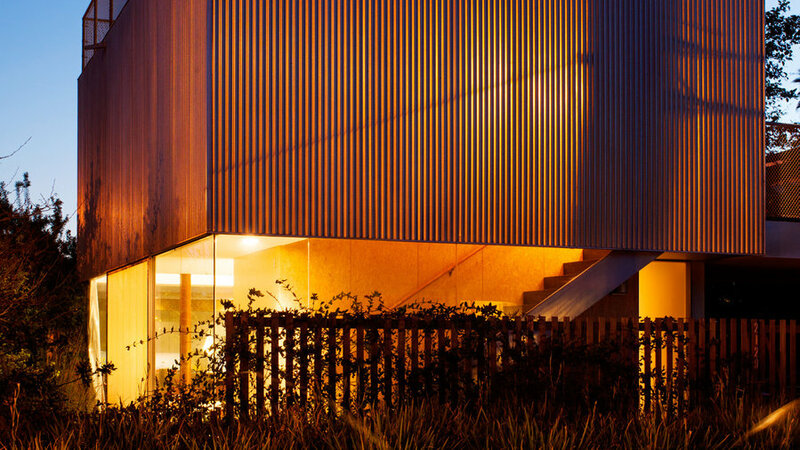 It heralded a bold reimagining of reuse in architecture. 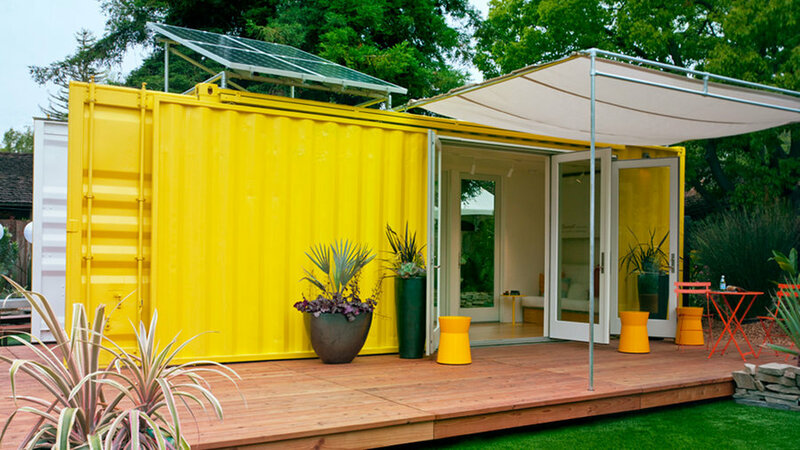 We followed the lead, letting readers tour a home contained in a single shipping container during 2011’s Celebration Weekend. The sprawling ranch home will always be the West’s signature, but in space-strapped big cities, the need for small footprints (only 680 square feet in this case) means building up. Not to say multiples stories means wasted space and excess square footage: The 1,500 in this house feel more expansive because of the sliding doors and opaque paneled exterior that let light in.